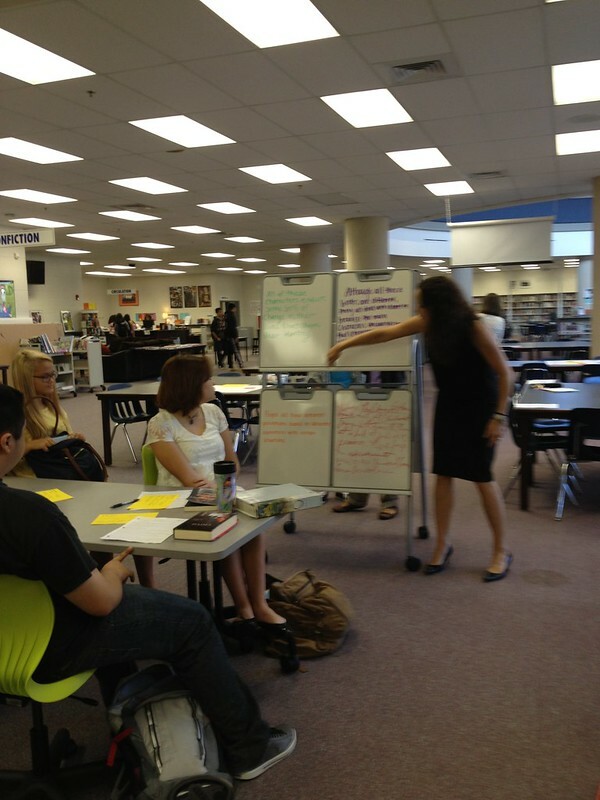 Last year, Jennifer Lund and I worked with a small group of Language Arts teachers to pilot an independent reading component to their courses. 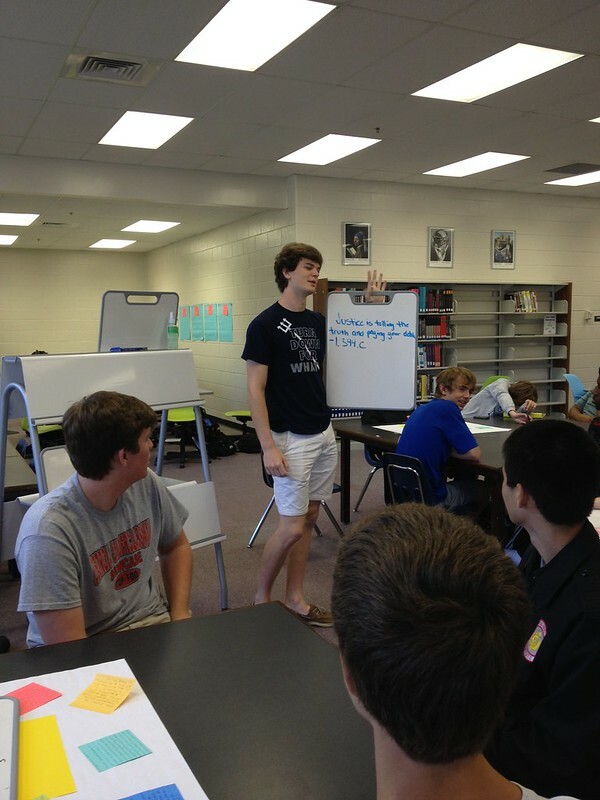 This initiative focused on providing students a dedicated day a week (most selected Wednesday) to read any text of their choice for an entire class period. 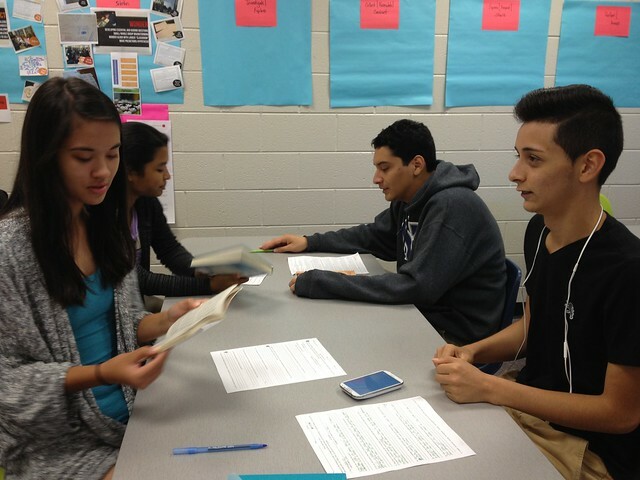 We worked with teachers and students to provide targeted readers’ advisory, individualized and small group recommendations, and ideas and strategies for formative assessments; we also documented best practices and interviewed students about their learning experiences. 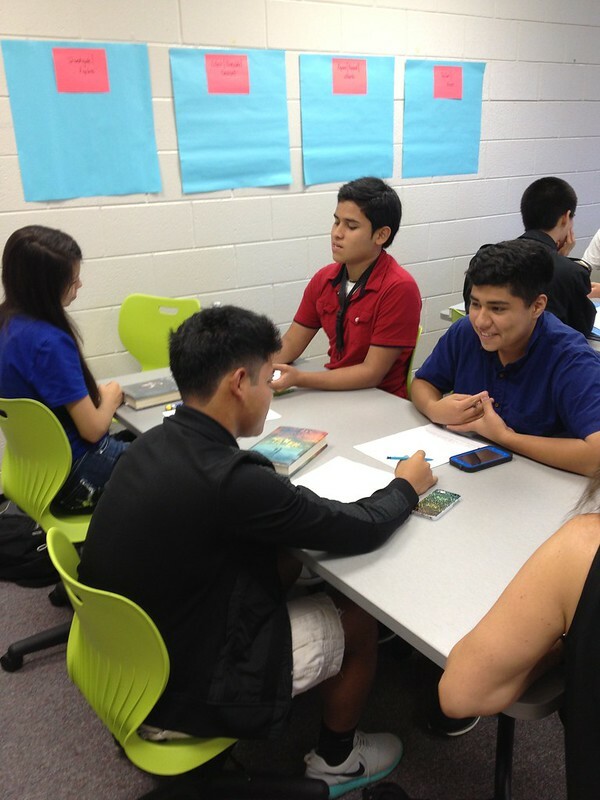 This year, all Language Arts teachers who teach Honors and College Prep courses are implementing the independent reading time component into their curriculum and class time. We’re continuing last year’s efforts and striving to work with faculty more closely to implement creative and meaningful formative and summative assessments of students’ literacy experiences. We know from other colleagues who teach Language Arts that teachers sometimes struggle to find ways to either help tie together so many different readings that are ongoing at any given time; others wonder how they might connect the independent reading students are doing to larger class thematic studies. 2. 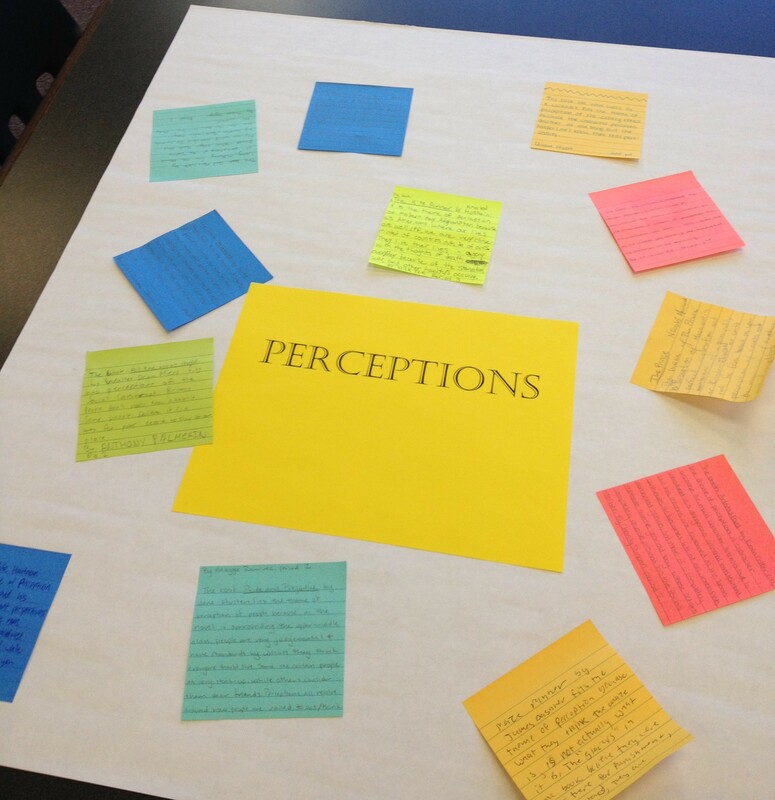 Helping students connect their current individual readings to four larger ongoing class themes: perceptions, justice, identity, and conformity. 3. Bringing together students in small groups to share their thematic connections and collaboratively develop a broad statement about specific themes based on their texts and shared insights. We’d like to share with you an overview of how the activity flowed today with her two classes this morning and some initial reflections/observations. Yesterday, the students were asked to complete a short homework assignment in which they were asked to do some brief guided reflections to bring to class today as a springboard for conversation; she refers to this set of guiding questions as the Book Talk Prep Form. 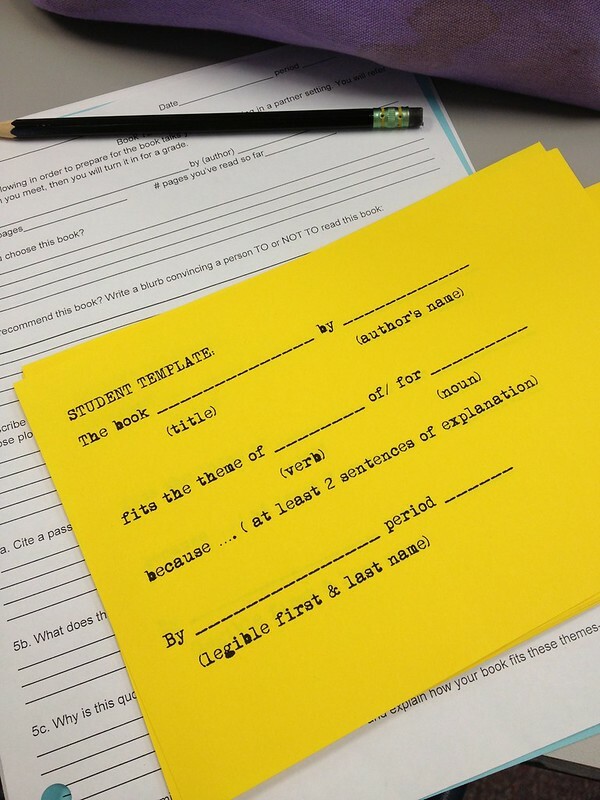 After doing a quick check of student work as they arrived in the Learning Studio area (formerly Fiction as you may notice from our photos), Sarah first reviewed the procedures and tips for engaging in a paired book chat. After making sure every student had a partner and giving students an opportunity to move themselves to a partner if needed, the discussions were on! 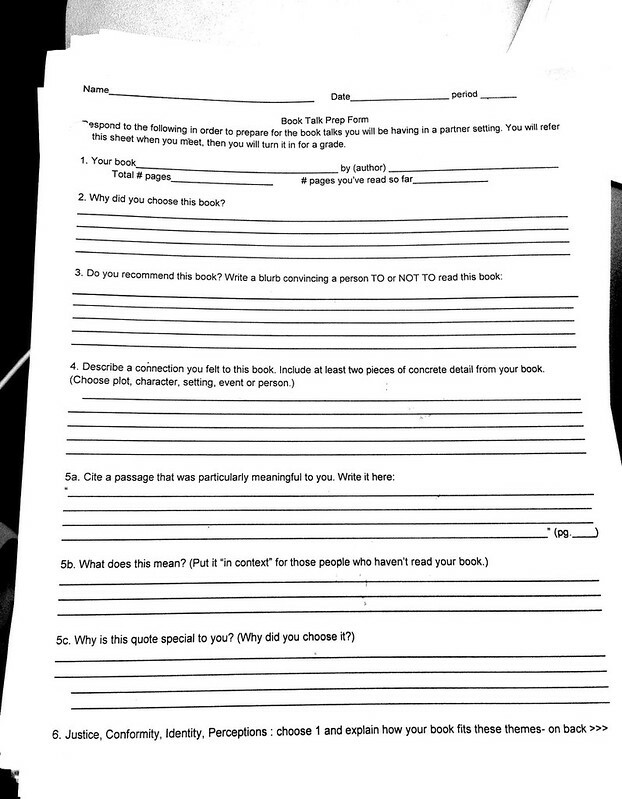 Many students referred back to both their book chat prep form as well as their texts (mostly print but some eBooks on phones). While students were encouraged to focus on discussing with their partner, we noticed some students engaging in a larger group discussion at their tables. After the first five minutes or so, Sarah paused the student conversations to remind them to slow down and encourage them to go more deeply into their discussions; she also provided some tips on talking about thematic connections and engaging in some higher level questions they might ponder as part of the conversation. This scaffolding was helpful for those students who might have been less experienced with these types of book chats and who needed some gentle support. After students had chatted roughly five additional minutes, we paused again to review instructions for the next phase of the activity. 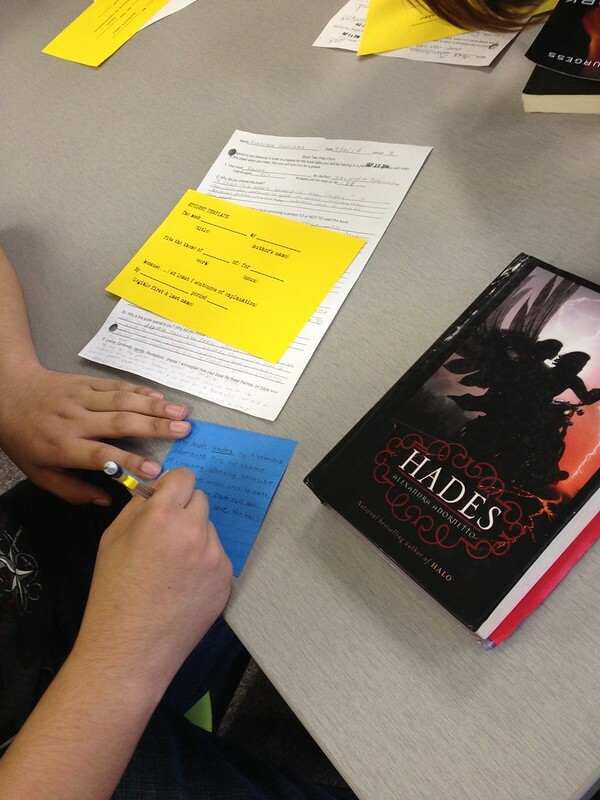 Sarah distributed sticky notes and provided a short template to help students think about how their books related to one of the four larger thematic themes of class study (justice, perceptions, identity, and conformity). 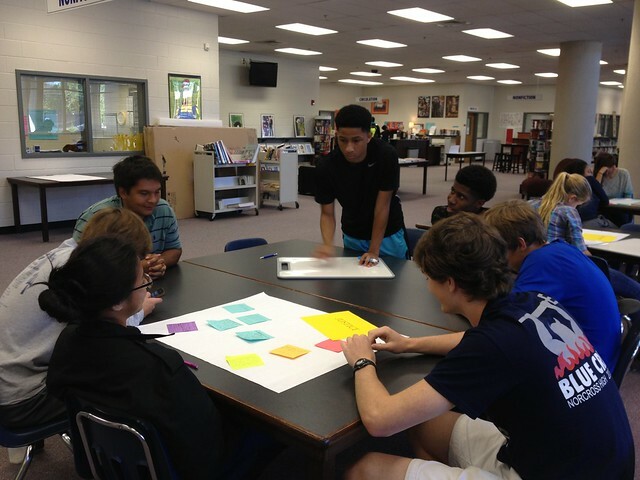 Students had about five minutes to compose a rough working statement about how their book embodied one of those four themes; students discussed ideas with their partners and peers at their table and when needed, conferred with Sarah for clarification or a short think aloud with her to process their thoughts. 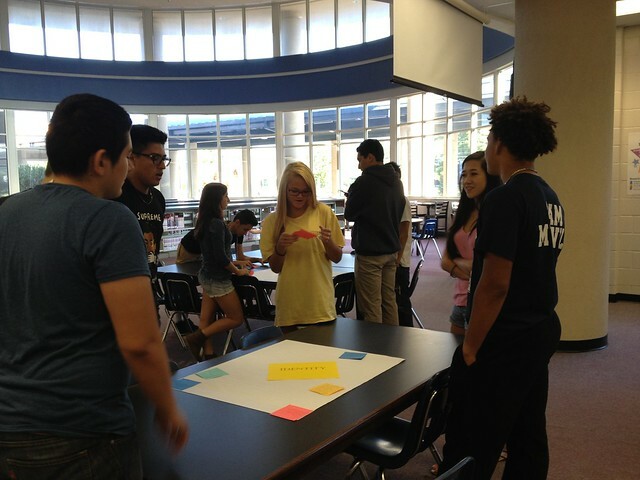 Once students completed their rough statements on the sticky notes, they then got up and moved to tables with large post it notes that served as “parking lots” for each of the four themes. 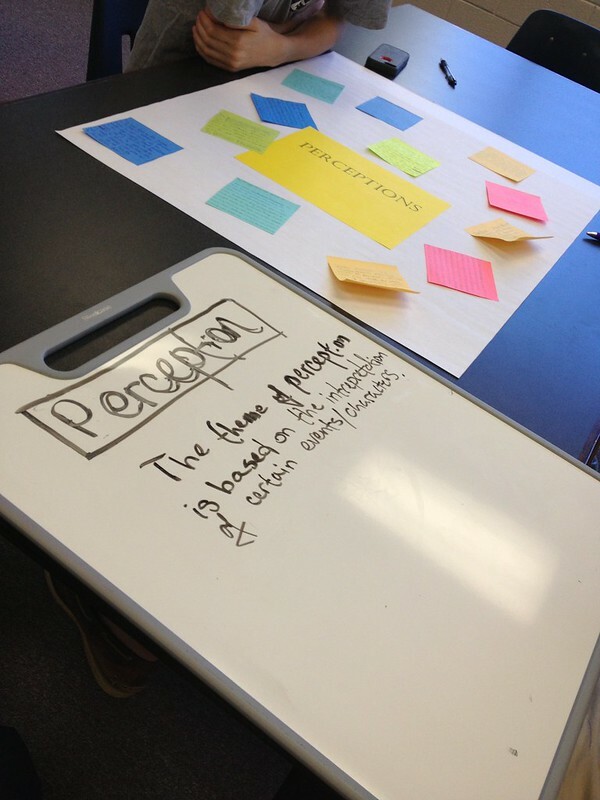 Because “identity” was a popular theme in both classes, we created a second parking lot for this theme on the fly. Once students had grouped themselves by them and shared their sticky note statement in the “parking lot” on the jumbo post-it, each student shared his/her statement. Interestingly enough, the 2nd period students all chose to stand as they talked while the 3rd period students immediately seated themselves at the table for the shared conversations. We then asked students to come up with a collaboratively crafted statement about their interpretation of the theme based on their shared statements rooted in the individual readings/texts. 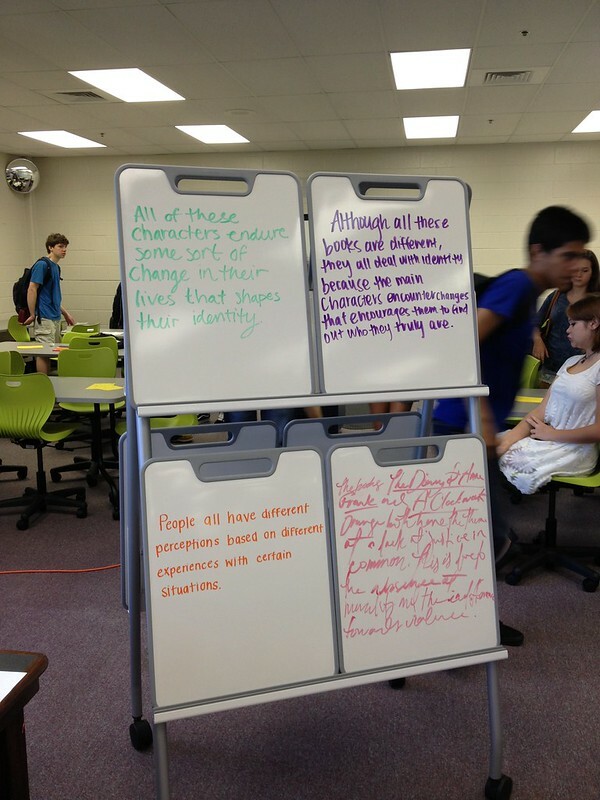 We chose to use our Steelcase Verb whiteboards and easels for students to record their group statement. 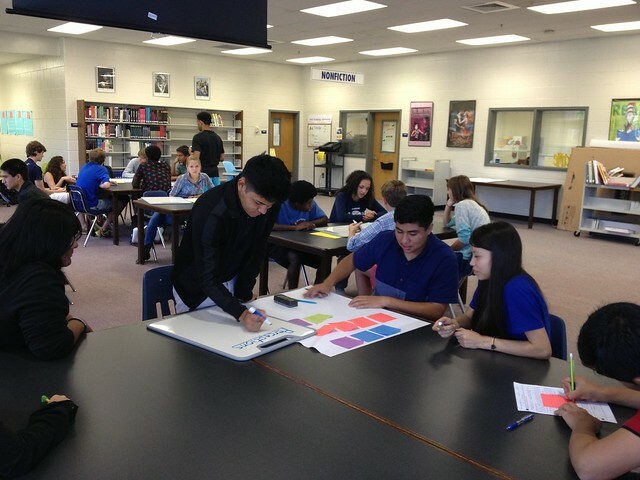 …but for our 3rd period, we all decided to let students share their work from their tables and discuss the group statement they had crafted. This second variation definitely had a better flow and student engagement in terms of their large group share aloud component—we love being co-learners in these experiences! The student response was positive, and we loved having the opportunity to use our new learning space and furniture to support Ms. Rust and her students in these conversations about texts and inquiry. We are looking forward to our continued collaboration with Sarah this year, and we’ll be incorporating this kind of work into an upcoming inquiry/research unit we’re doing later this fall with her classes. We invite you to think about how you might use these strategies and structures for your own independent reading program or how you might adapt them for content area study! Thank you so much for this post! I like how this lesson helped students make meaningful connections between their independent reading books and start a conversation about the larger themes for the class. 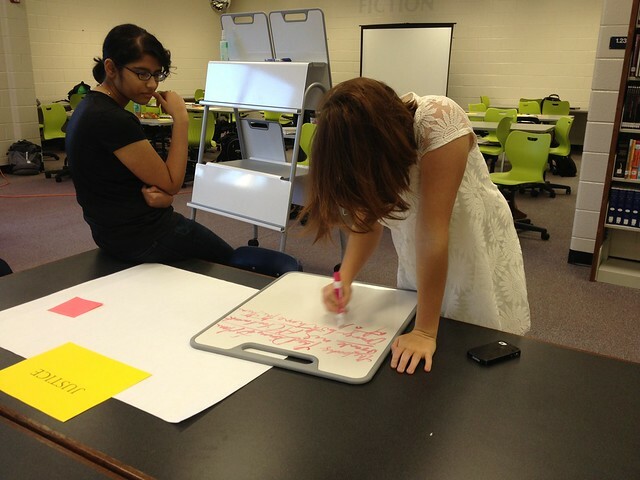 Inquiring with Students: What Do or Can “Good” Research Projects Look Like?